Okay don’t hate me but it’s another pumpkin recipe…. its just that pumpkin is sooo good that I canNOT get enough!!! I literally stock up on canned pumpkin this time of year. Maybe its an addiction?! Anyway, back to the recipe: HEALTHY Pumpkin Spice Donuts!!! These are amazeballs!!!! Please promise me you will give them a try! Spray donut pan with non-stick spray. Blend all the donut ingredients together until smooth. Pour mixture into donut pan and bake for 10-15 mins until donuts bounce back to touch and start to pull away from donut pan. While donuts are baking blend together frosting. Top donuts with frosting and sprinkles if desired. Don't have casein for the frosting? Use whey protein. Just decrease the liquid amount. 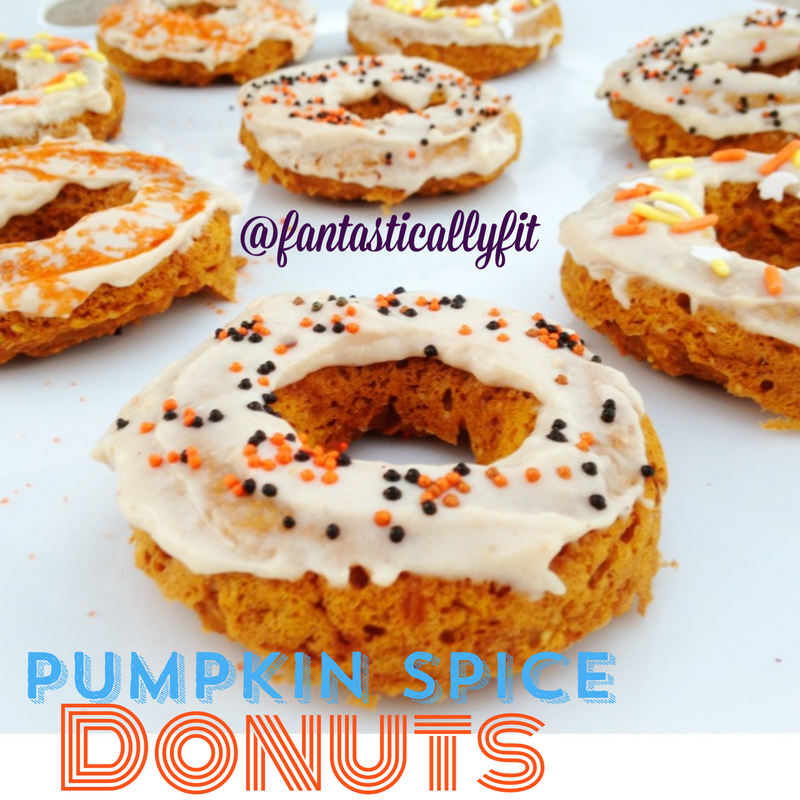 0 Responses to "Healthy Pumpkin Spice Donuts"
Yum! These sound great! Perfect for fall. Is there anything you can use instead of the maple extract. I can’t even find pumpkin puree or I am making it from scratch! I just moved to Geneva, Switzerland and would love to make these. I used mashed butternut squash. I had to bake several minutes longer though for some reason. Well I hope it turned out okay! Can u tell me the nutritional info? Hi Jennifer, I don’t count calories sorry. I entered the recipe into MFP and got 102 calories per donut (815 for the batch) 2 fiber, 18 carbs, 6 protein, 132 sodium and nine sugar. They look so yummy and at 102 per donut….yes please! you can always fill in the ingredients yourself with an online calculator such as http://www.myfitnesspal.com/recipe/calculator, I believe you can use this without registering, many sites you have to register/join to use theirs. I am sorry to hear that! The oats act as the flour. Others have made it with no problem. I started thinking that too, but let them bake quite a bit longer to firm them up. Do you think you could you substitute whole wheat flower for the oats? I’m making them for a big party and I’m wondering if the non-clean-eaters may prefer the texture if it was less lumpy from the oats? Just wanted to get your opinion before trying! I have only tried them with oats. Maybe experiment with a small batch first and see how it goes?